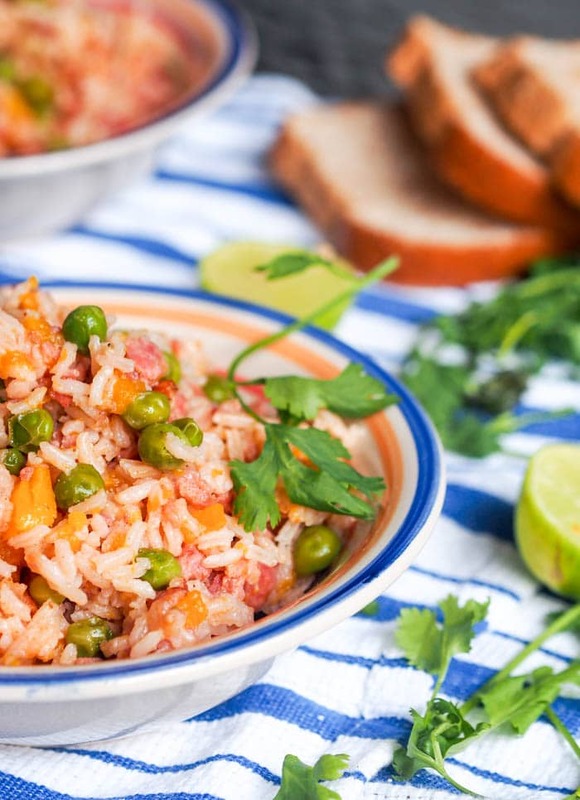 One Pot Italian Sausage Rice with Squash and Peas make for the perfect weeknight meal ready in 40 minutes. Comfort food at its finest. Everything gets cooked in staged all in one pot with minimal prep time. A healthy dinner! I’m all about one pot meals. They’re the best. No pots and pans to clean up. Just one pot. And the best part about one pot meals, or at least the ones that I make, is that you can prep ingredients as you go. Get the sausage ready and throw it into the pot, as that’s cooking start slicing, dicing and prepping the other ingredients. As one cooks the other is being prepped to be tossed into the pot. No need to get everything ready beforehand. This I love. Kitchen multitasking is my thing. It just makes everything more efficient right? I’m sure you’ve seen my other one pot recipes including my one pot vegan lentil curry with tomatoes, one pot rice and sausage dish, etc. The new star ingredients added into this dish are peas and squash. 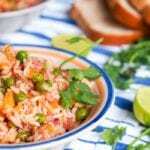 Normally I add tomatoes to my one pot meals as they cook down marvelously and that tomato flavors gets absorbed by the rice and makes it super flavorful. Enough of that though, that’s been done before. How about squash though? Squash might just work even better in flavoring the rice in the finished dish. The squash gets diced into small cubed and as it cooks along with the other ingredients it start to break down, into more of a squash mash – a super creamy squash mash. The squash adds a creamy element to the final dish, that tomatoes simply don’t. And then for the peas. Peas seem to be a dreaded ingredient by many (possibly childhood nightmares of being force fed the dreaded veggie preventing further consumption), but seriously peas are kind of wonderful. I rarely cook with them, but I saw a package of fresh peas at the Peruvian supermarket, and I just thought why not? They add a nice little pop of green flavor into the creamy Italian sausage rice dish and work well with all the ingredients. If you hate hate hate peas, you can omit them, but I seriously encourage you to give them another shot! Once all the ingredients are added to the pot, you let everything simmer, covered for 15-20 minutes or until the rice is cooked through. This one pot Italian sausage rice with squash and peas makes for a perfect one pot comfort weeknight meal. A healthy dinner high in protein with lots of veggies thrown in! 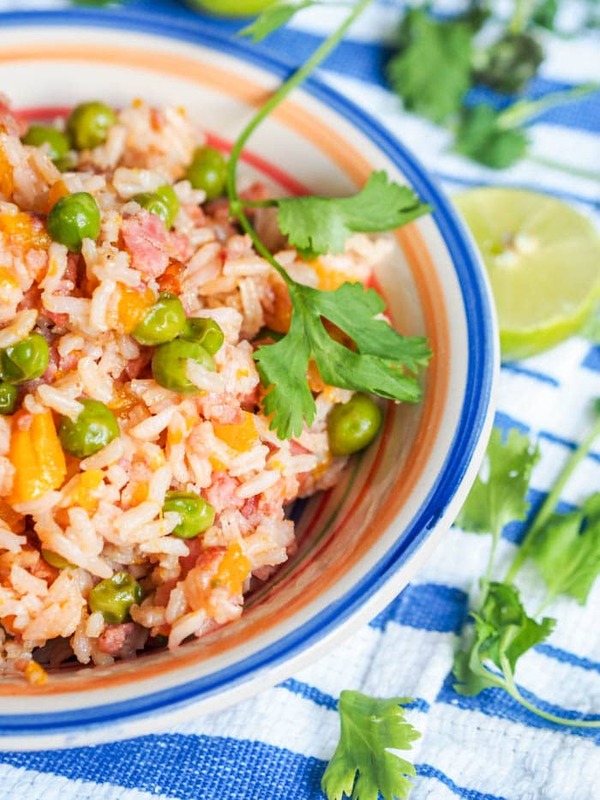 One Pot Sausage Rice with Squash and Peas make for the perfect weeknight meal ready in 40 minutes. Comfort food at its finest. Add sausage, breaking it up into smaller pieces with a spatula. Cook until browned. Add onions, cooking for a couple minutes. Add rice and cook for a few minutes, mixing everything together. Looks easy and delicious. I will try to make it this weekend. Thanks for sharing with us!